Observations of the Sun go back as far as humanity itself. People have always known that the Sun gives us heat and light, and because of that is vitally important. 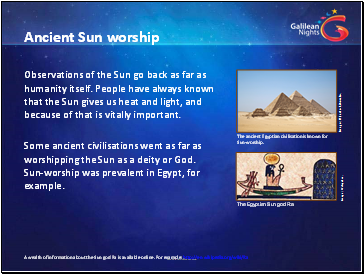 Some ancient civilisations went as far as worshipping the Sun as a deity or God. Sun-worship was prevalent in Egypt, for example. The Egyptian Sun god Ra. The ancient Egyptian civilisation is known for Sun-worship. So important was the Sun to people’s lives that monuments were constructed to mark its passage in the sky throughout the year. These acted as calendars, signalling the changing seasons and times to plant and harvest crops, among other things. 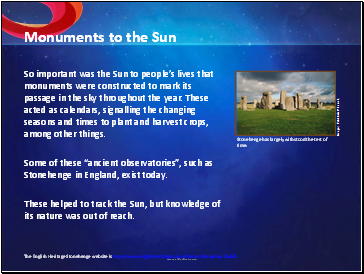 Some of these “ancient observatories”, such as Stonehenge in England, exist today. These helped to track the Sun, but knowledge of its nature was out of reach. Stonehenge has largely withstood the test of time. 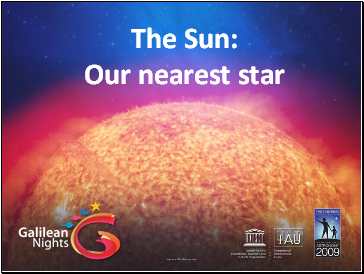 The ancient Greeks thought long and hard about the true nature of the Sun. Some philosophers reasoned that is was a large flaming ball, very far from the Earth. 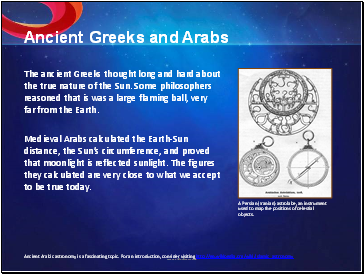 Medieval Arabs calculated the Earth-Sun distance, the Sun’s circumference, and proved that moonlight is reflected sunlight. The figures they calculated are very close to what we accept to be true today. A Persian (Iranian) astrolabe, an instrument used to map the positions of celestial objects. The theory that the Earth moves around the Sun, and not the other way around, was devised by ancient Greek, Indian, Babylonian, and medieval Arabic astronomers. 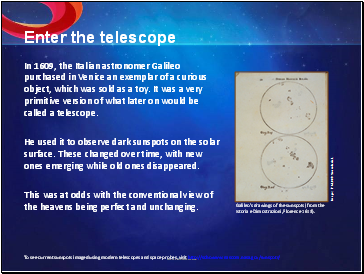 This idea was revived and popularised in the West in the 16th Century by Nicolaus Copernicus. 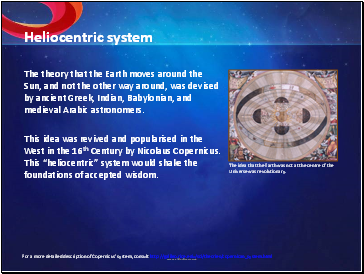 This “heliocentric” system would shake the foundations of accepted wisdom. The idea that the Earth was not at the centre of the Universe was revolutionary.